Make a customized glowing patch using Electroluminescent (EL) panels! Design your own fabric stencils with Silhouette cutting machines to cover up parts of square light-up panels to create customized designs. You'll learn how to design a fabric stencil mask and use the cutting machines, soldering, and how to best plan for electronics to be integrated into a fabric project. The patches can then be attached to clothing, backpacks, and more. No soldering or electronics experience required. Each participant will have a chance to create their own 4"x4" light-up patch. Feel free to bring along an item you would like to attach it to. Who says kids get to have all the fun? Join us for an Adult Play Date. Learn a new skill and have some fun! This month you will learn to create a simple circuit to light up a felt badge, barrette, or bow tie. Adult Play Dates are BYOB. What opportunities can DIY wearable tech create for the future of self expression? We’ll share prototypes of our modular system that can be reconfigured for a variety of interactions and style choices. Participants will creatively explore personalization through both code and hardware assembly to construct a unique piece of wearable tech to bring home. Participants will actively explore these ideas through customizing a wearable electronic project to augment their interactions with the world. Available to registered Hackaday Superconference attendees. Registration info here. Learn how to incorporate electronics directly into your costumes or fabric props using conductive thread & LilyPad sewable hardware. In this session, you will get an overview of ways to plan how to add lights, sound, & other interactive elements to your existing costumes plus tips & techniques. Learn how to incorporate electronics directly into your costumes or fabric props using conductive thread and LilyPad sewable hardware. 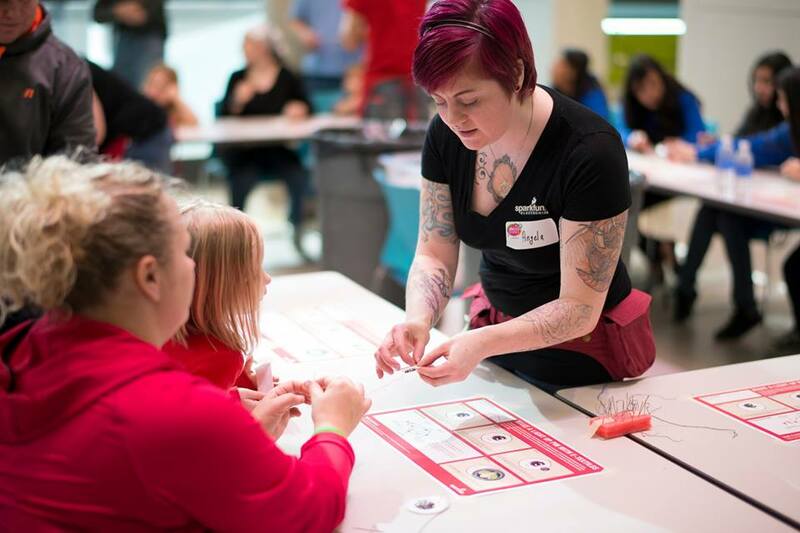 Get an overview on how to add lights, sound, and other interactive elements to your existing costumes, including hands-on experience crafting a light-up badge to take home using sewable electronics (first come, first serve, limited quantity available). Available to registered WhimsyCon guests.